Naomi Shihab Nye is one of the most beloved poets in America, and the poem “Famous” is literally her most famous poem. It has been used in countless commencement speeches—from elementary school to university graduations. 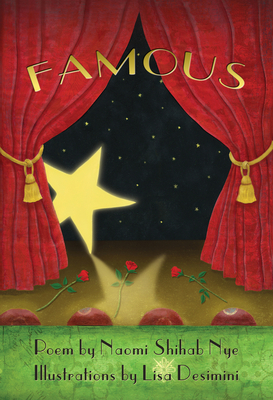 At once simple and profound, this illustrated version of the poem is a charmingly ironic take on what it means to be “famous.” It is a perfect gift book for people of all ages—for those who need encouragement, who are at a crossroads, who are graduating, who are nervous about the future, or who want to be more or other than they are. Naomi Shihab Nye is a poet, author, and songwriter who has received the Paterson Poetry Prize, the Jane Addams Children's Book award, and four Pushcart Prizes. She lives in San Antonio, Texas. Lisa Desimini is a children’s book author and illustrator. She has illustrated more than thirty books and written nine herself, including My House, which was one of the New York Times Ten Best Illustrated Books of the Year. She lives in Topanga, California.